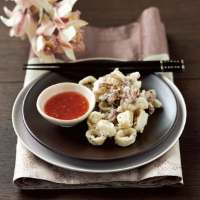 Add spice to tender, wok-fried squid in this variation on a traditional Chinese recipe. Wash the squid under cold running water and drain thoroughly. Remove the tentacles from inside each one and check that all the cartilage (the hard connective tissue) has been removed. Cut the squid into rings about 2cm wide. Mix the cornflour, pepper, salt and five spice together in a large bowl. Add the squid rings and tentacles and mix well to coat. Heat the oil in a wok or a medium-sized, deep saucepan over a high heat. When the oil is very hot (but not smoking), add the squid in at least 5 batches and cook for 1-2 minutes per batch, or until they have risen to the surface and are turning golden. Remove the squid with a slotted spoon. Set each batch aside on kitchen paper and cover with foil to keep warm while you cook the remaining squid. Ensure the rings and tentacles are well spread out so they remain crisp. Serve the hot squid immediately, with the sweet chilli sauce to dip and lemon wedges to squeeze over. Prepare the squid in advance, then cover and chill until required. Make up the salt and pepper mixture ahead then coat and cook the squid at the last moment. This recipe was first published in February 2005.